Judas Priest formed in the industrial city of Birmingham, England, in 1969. With its distinctive twin-guitar sound, studs-and-leather image, and international sales of over 50 million records, Judas Priest became the archetypal heavy metal band in the 1980s. Iconic tracks like "Breaking the Law," "Living after Midnight," and "You've Got Another Thing Comin'" helped the band achieve extraordinary success, but no one from the band has stepped out to tell their or the band's story until now. As the band approaches its golden anniversary, fans will at last be able to delve backstage into the decades of shocking, hilarious, and haunting stories that surround the heavy metal institution. In Heavy Duty, guitarist K.K. 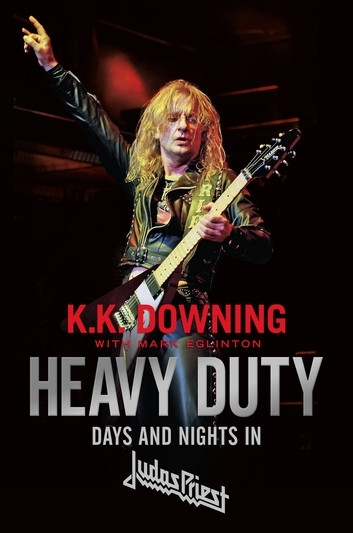 Downing discusses the complex personality conflicts, the business screw-ups, the acrimonious relationship with fellow heavy metal band Iron Maiden, as well as how Judas Priest found itself at the epicenter of a storm of parental outrage that targeted heavy metal in the '80s. He also describes his role in cementing the band's trademark black leather and studs image that would not only become synonymous with the entire genre, but would also give singer Rob Halford a viable outlet by which to express his sexuality. Lastly, he recounts the life-changing moment when he looked at his bandmates on stage during a 2009 concert and thought, "This is the last show." Whatever the topic, whoever's involved, K.K. doesn't hold back.